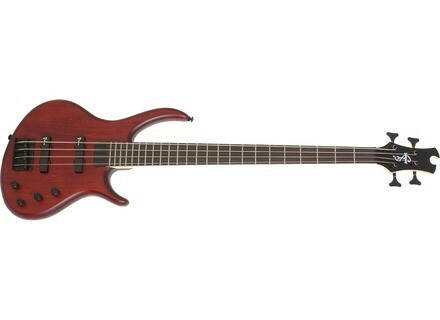 Toby Deluxe IV, 4-string bass guitar from Epiphone in the Toby series. zeetoon's review (This content has been automatically translated from French)" Beautiful Instrument"
Made in Indonesia. Channel "asymmetrical" it seems ... it is not very sensitive, but as the handle is super comfortable, spend. Two single coil pickups with a passive or active electronic rudimentary but effective. Very good grip, low very light. I do not have confidence in the material body, "Radiata Pine" but last year he did not move. And it provides good vibrations apparently because I find the sound very good, fairly passive until modern vintage, slamming active. The design of the instrument is blah ... but comfortable. I get the sounds I want this bass, playing mostly insert into the sound card, but on my old Montarbo SIO. Used an old Ibanez 80 years heavy and whose handle is a log, I rediscovered the pleasure of playing bass. Bought it a year ago. I owned a Fender MusicMaster, Ibanez in question and Squier JazzBass (which was very good too, to 86/87). I'm mostly a guitarist and I needed a little low for models, Ibanez (even equipped with Seymour Duncan) makes a sweet sound too. The Epi is good in all registers, only the price is sweet. I do not even want to imagine better is the 2nd Epiphone I bought (the other is a Wildkat) and I love these guitars.